With one of the most recognizable building silhouettes in the world, the Pentagon came to symbolize modern American military power. However, it was built to consolidate the scattered parts of the War Department under one roof, a task that took on urgency as war threatened to engulf the United States in mid-1941. The challenge of designing the new building fell to G. Edwin Bergstrom, Chief Consulting Architect for the War Department, and David J. Witmer. In July 1941 Witmer and Bergstrom sequestered themselves for a weekend and settled on the basic outlines of a design. 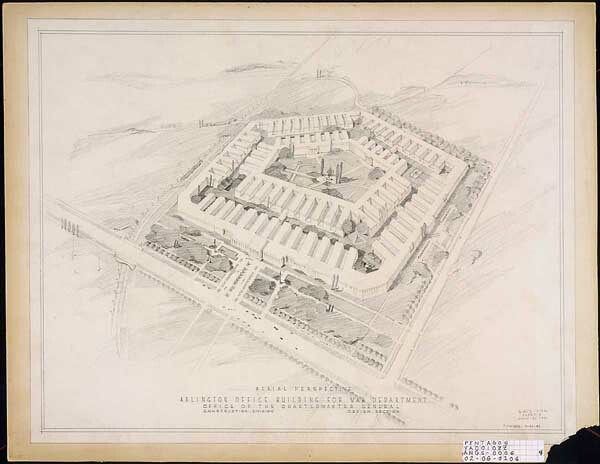 T. Stathes's drawing shows the now familiar five-sided shape they agreed on; later revisions transformed the building's barracks-like inner structure into a series of concentric circles. The building's shape, which echoes the star design of early forts, and its interior courtyard remained unchanged. Construction began in September 1941. Workers labored around the clock until it was completed in December 1942.